Small piles of green beans are starting to appear in the markets. these goes well with spicy and not so spicy food. Cook the beans to just tender in plenty of lightly salted, boiling water–use tongs to whip one out of the water to test for doneness. When they start to pop add the garlic. Cook until it starts to turn light brown–careful not to burn it–it won’t take long. Add the beans and the salt. Turn the heat to low and fold the beans over in the oil and spices. (You are heating through and infusing the beans with the flavours–5 minutes should do it). Great recipe, Robin . . . and even greater picture. Thanks, Barbara–hope you find good beans up there. Great recipe. We just got one of her books, Curry Easy, and are doing more and more with it. Lovely “still life” photo! 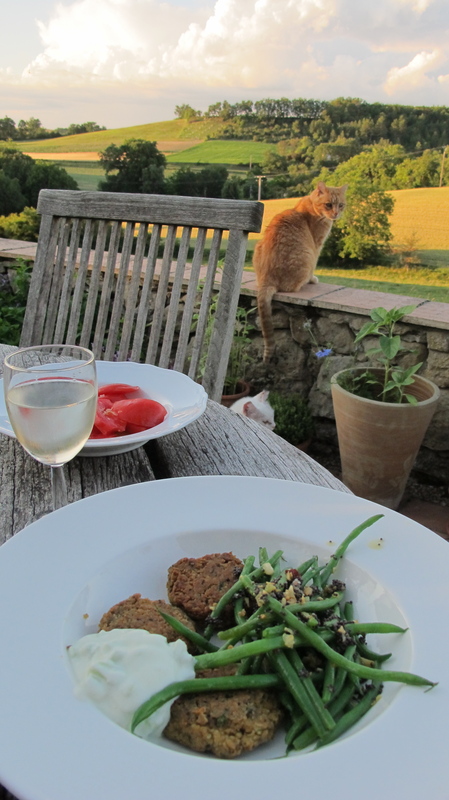 The recipe looks wonderful but especially enhanced in such an idyllic setting. Thanks for posting. Interesting recipe! 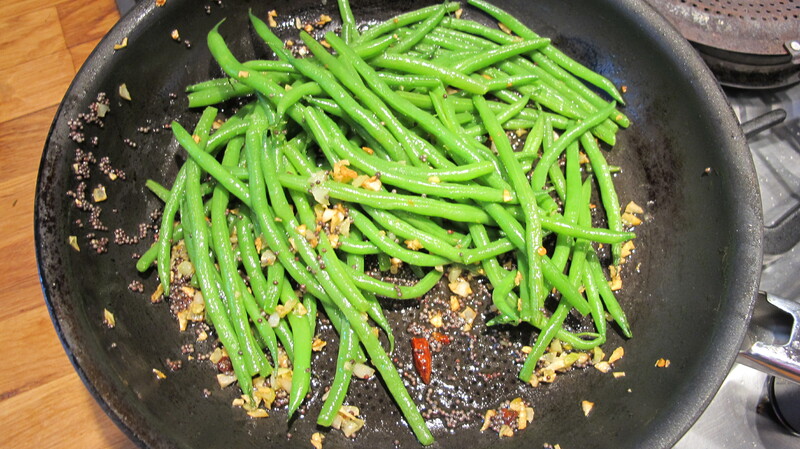 I love green beans, I will cook it on week, end: thanks!! It looks like Butterscotch, but that is her dear brother, Marmalade (who is more like a labrador retriever than a cat). Meredith, one of our indoor/outdoor kitties named Beau is more like a dog than a cat. Everyday when we bid him goodbye, we always say “Guard the house, Beau”. During our evening walks, Beau tries to herd us back home. He runs ahead of us about 20 feet, waits patiently for us to catch up, runs ahead another 20 feet until we return home with him. We adore our little retriever…. took advantage and went out. What a very peaceful view your two beautiful cats looking out enjoying their lovely home.